The grassroots Enduro mountain bike racing series is run by local clubs with the single goal of encouraging anyone, regardless of age or gender, to try racing in the simplest format. Its success is measured based on the feedback received from those who participate. The one day blind race format is unique in that riders do not get to practice in advance, but can attempt the stages multiple times as they like before the cut-off time (usually a maximum of two attempts per stage). This weekend I headed down to Bike Park Ireland to race the first round of the Polygon Grassroots Enduro Series. Selling out in minutes, and with a waiting list of over 100 riders, this was one race I was really excited about! Not only was it to be my first race of the season, but my old club, Galway MTB, were running this round so I knew it was going to be a knockout! They certainly did not disappoint. The format of this race series is very different to the regular Enduro series. Similar to the Welsh Gravity Enduro Series, it takes the format of three stages which are raced blind i.e. no practice the day before, with each stage ridden as many times as you wish. It’s a great format as it works for people who can only get one day over the weekend to race, rather than the usual two day event of most Enduro’s. ​I spent all day Saturday getting my bike in perfect working order, with a little help from friends : ) A new Reverb dropper seat-post, change of brake pads, gear cable, new bottom bracket bearings, brand spanking new WTB Convict Tyre on the front, a WTB Vigilante on the rear and a good clean, the black beauty was in prime condition for racing. Knowing that my bike was mint, gave me an enormous sense of calm and confidence leading into the race. The rest of the day was spent preparing my meals for race day, packing my kit (two full sets in case of bad weather) and packed up the van. Asleep by 10, I was out the door by 7am, with my pre-prepared banana pancake in hand and coffee in the other, I set off on the two hour journey to Tipperary. Arriving at the race village by 9, there was already a great buzz about the place and the it was filling up quickly with lots of familiar faces milling around the place! After a quick change into my race kit, I was up to registration and putting on my race plate in no time. On the bikes by 10.15 and off we went on the transition climb up the hill to hit Stage 1. So here’s how I got on…. Stage 2 – This was pretty much the new Black run at the park. With the wet conditions, this stage turned from great to bloody awesome! If you touched your brakes on this one it was only going to lead to a wipe out! By far my favorite stage of the day, I managed to shave 4 seconds off my time on my second attempt. Stage 3 – This is where things went slightly downhill! I decided to do one run of this, stop for lunch, then head back up in the afternoon. In hindsight, with the conditions as bad as they were, I would have been better off riding this stage early in the day as it had become really muddy and the bike getting so clogged up. My first attempt, I made the mistake of listening to others and chose to run up the big climb in the middle of the stage. This lost me valuable time, so after lunch, (and a complete new change of clothes!) on my second attempt, I pedaled up the steep climb during the stage no bother and rode well but fairly conservative. I decided to head up for a third attempt, but at this stage, any gains I had made with nailing the climb and the rest of the technical bits, I lost when I totally wiped out (and ate dirt) at the last turn onto the grass, which at this stage had claimed many other riders, and ended up having to run with the bike to the timer. This, along with the worsened conditions, I lost valuable seconds, and my first attempt turned out to be my best time, even though I didn’t ride as well. Lesson learned. After an absolutely savage days racing and having the craic, it was time for a cuppa tea and some downtime. I caught up with Owen Franssen from Emerald MTB website to chat about racing and life as a privateer. Next up it was podium time. I was really happy to come away with 2nd and an overall result of 25th out of 145 riders. This was a really nice boost of confidence for me to start out the season with. Huge congrats to Leah Mansaul for taking the win and to Lorraine O’Sullivan for coming 3rd. 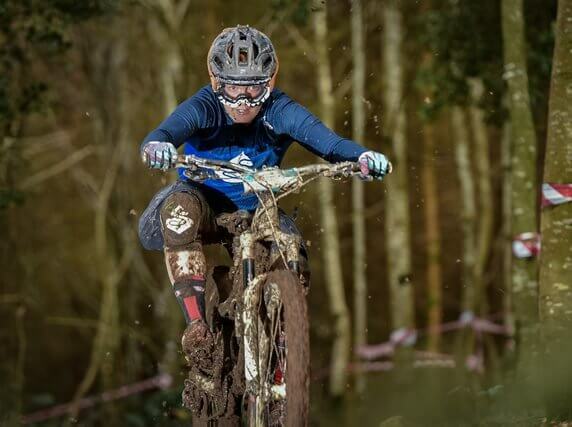 ​A massive well done to Galway MTB, Bike Park Ireland and Biking Dirty for such an awesome event! The bar has been set lads! Finally, a massive thank you to my sponsors Flow MTB for their support and to WTB who are keeping me stocked up this season, the Convict did an insane job of keeping me upright all day! It was brilliant to see new faces on the race scene too! With a whole new batch of women taking to the sport, we’re starting to see a great surge in women’s mountain biking in Ireland. Looking forward to seeing more new faces at Round #2 in Killaloe in four weeks time!